Halloween has arrived! While you’ll probably receive lots of good-natured visitors, it’s just as important to ready your house for unexpected guests – especially the kind that can sneak in through cracks and crevices. These little visitors aren’t so cute. Seal up all cracks and crevices. Perhaps as you’ve decorated your house for Halloween, you’ve noticed seals and cracks along windows and doors. These are the exact cracks and crevices that invite termites into your home. Making sure these are sealed (along with sealing off places like the attic and garage), is crucial to termite protection. Cover large openings with mesh screens. Larger openings, such as gaps around pipes and vents, will be harder to seal. Using a fine mesh screen in these areas will provide the protection against termites you need. Termite inspections. Most pest control companies provide free termite inspections that can help quell termite damage before it has gone too far. Termite swarms. Usually finding termites around your house means you have termites. As termites take flight from the nest and “swarm” they lose their wings. So finding swarming termites, or termite wings (usually appearing along window sills and door openings) might mean you have a termite problem. Piles of pellets. These little”pellets” are actually termite droppings (“frass”). Finding piles of this can mean you have a termite problem. This frass is left behind as termites burrow through wood, so you’ll usually find it around furniture, or places where wood is featured in your house. Wood blisters. Blisters under varnish or paint are often caused by the tunnels termites create as they move through wood. 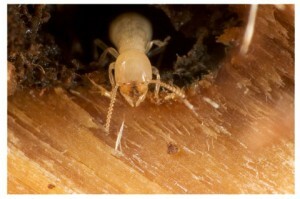 Termites are tricksters year ’round. Taking care of your house, as well as keeping your eyes out for any termite damage, is key to making sure you don’t get tricked this Halloween season, or any other time of year. Need help in Chandler? Visit Chandler Termite Control.